Godfrey Garza, the former general manager of Hidalgo County Drainage District No. 1, made more than $3.5 million in commissions on a South Texas border fence project that was largely bankrolled by the U.S. Department of Homeland Security. 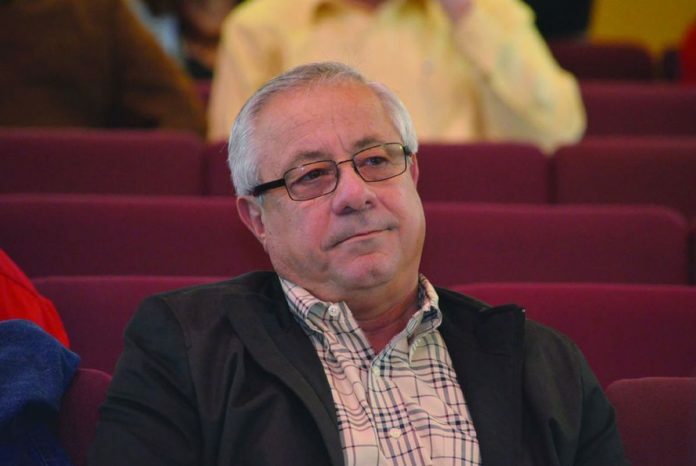 EDINBURG — Former Hidalgo County Drainage District manager Godfrey Garza Jr. has asked a judge to throw out a lawsuit the county has filed against him, alleging breach of contract, fraud and conspiracy. This latest request comes weeks after Garza was back in the news, the subject of a Texas Tribune and ProPublica border wall investigation, following numerous stories and editorials over the past couple years by The Monitor. Garza’s Jan. 10 motion for summary judgment says Hidalgo County Drainage District No. 1 has “no evidence to support its inflammatory allegations” against those named in the lawsuit, which include his company, Integ Corporation, as well as his wife’s company, Valley Data Collection Specialists Inc.
Garza and his wife, Annie Q. Garza, and sons Godfrey Garza III and Jonathan Garza are also defendants in the suit. On Friday, attorneys for both parties appeared before a visiting judge, Martin Chiuminatto, for a court-ordered mediation, but nothing was resolved, according to county officials. Even if an agreement had been reached, it would have to be approved by Hidalgo County commissioners before being finalized. The drainage district’s January 2017 lawsuit alleges that “(d)efendants acted with fraud, malice and gross negligence,” and as first reported by The Monitor, Garza made millions of dollars from Hidalgo County drainage construction projects, despite the county still having major flooding issues. In addition to Garza’s $120,000 annual salary, a yearly contract between he and the county was altered in 2007 allowing Integ to receive 1.5 percent of actual construction costs. This was for acting as construction manager for the Hidalgo County Border Infrastructure Improvement Project — otherwise known as the levee wall border project. The project, however, used both federal and county funds, and county officials say the federal money was never to be included in Integ’s commission. Leading the charge against these commission payments has been Hidalgo County Judge Ramon Garcia, who was not in office at the time Garza’s contract was changed. Garcia has argued that as drainage manager, Garza’s company should not be eligible for these extra monies. A 2015 independent report commissioned by Hidalgo County commissioners, who also comprise the drainage district board, found Integ was paid $3.73 million in commission fees as a result of the deal. “Not being satisfied with these millions of dollars in taxpayer funds, Godfrey Garza Jr. conspired with certain contractors to have another corporation owned by his family, Valley Data Collection Specialists Inc., paid as a subcontractor on the projects,” the lawsuit states, which was filed to “recoup the taxpayer funds illegally paid” to Garza, his family and their companies. The 2015 report also found that Valley Data received $1.1 million in drainage contracts. Chiuminatto is scheduled to hear Garza’s motion for summary judgment Jan. 31, in addition to all pending motions in the case. Garcia, who was deposed in October and November 2017, said he’s “optimistic” about the case. Garza has since been deposed following the Texas Supreme Court’s April 2016 ruling denying his request to dismiss his deposition order.